home > Bradbury > Church foyer specification. Other accessories - additional charge. 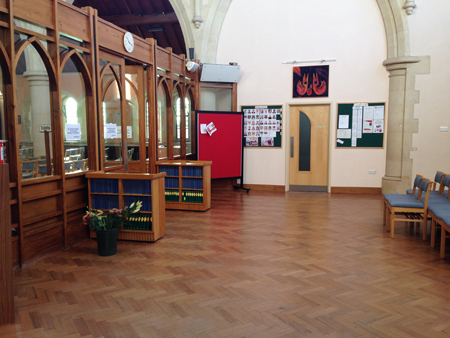 The foyer is separated from the Church sanctuary by a permanent wood and glass screen and it is possible to hire this area separately - although normally only when the Church itself is not in use. The light oak flooring of the main Church continues into the Church foyer and there is natural daylight. This area has approximately 35 chairs and 9 tables and can be laid out for a small meeting or group activity. The number of people allowed in the Church foyer depends on the use and the risk assessment carried out for the event. Please do not invite the maximum numbers to your event until we have agreed that your event will comply with safety regulations. The Church fully complies with all safety regulations regarding emergency exits and fire alarms etc. ; The risk assessment will centre on how you will get people out in the event of an emergency. For example it may take longer to get people out in wheelchairs or prams than a youth group. We will be able to help you with this. There is easy access from the main street for all users. The doors are fully accessible for wheelchair users and those with disabilities. There is level access to the Coffee bar and Bradbury Hall complex. 9 x tables 920 mm x 920 mm. Additional tables of different sizes can be supplied upon request. Other accessories include coat racks and hangers, uplights, electric heaters, children’s chairs. There is a Wi-Fi Broadband system in the Church - password controlled - which you may use free of charge at your discretion and at your own risk. Note that we do not have technical support available on a 24/7 basis and you should have a back up plan in case the Wi-Fi system goes down during your event. There are 2 x double 13 amp socket outlets positioned each side of the Church foyer. There are two radiators provided in the foyer area. The foyer area has natural daylight.